Journal of Arid Land Studies is a broad-based archival journal for the publication of significant research results in all areas concerning deserts, arid and semi-arid lands. Papers will be published only when they are judged by the Editor to be characterized by some general significant conclusions or by experimental and field data having probable lasting value. It is understood that a paper submitted to this Journal has not been previously published, accepted for publication or submitted for review elsewhere. Full electronic file(s) of manuscript in English, together with an attached file (preferably incl. full information on figures but less than 5 MB per each mail, otherwise only text form for main body) should be submitted by e-mail to (hold original figures until acceptance). Mr. Seiji Misumi (Editorial secretary). Shinkawa, Chuo, Tokyo 104-0033, Japan. Upon receiving the manuscript the Editorial Office will send notice of receive to the corresponding author. The author may ask the Editorial Office if he/she has no response for one week since submission. Submitted manuscripts will not be returned whether they are published or not. In addition, when the author submits one's manuscript, potential reviewers, at least one specialist, should be introduced to The Editorial Office. 1. Original Articles­ Formal presentation of significant and completed research projects. Enough originality is required. The length should be less than eight printed pages (about 6000 words, incl. Figs. etc.). 2. Research Notes­ Brief reports with originality. Supplemental or intermediate reports. Reports which require prompt publication is also submitted. The length should be less than four printed pages (about 3000 words, incl. Figs. etc.). 3. Review Article- An article that summarizes the current state of understanding and previously published studies on the specific topic. Lastly, the brief future prospect is required. The length should be less than eight printed pages (about 6000 words, incl. Figs. etc.). 4. Materials and Reports- First hand materials valuable to be quickly reported. The length should be less than six printed pages (about 4500 words, incl. Figs. etc.). 5. Others­ Articles which are approved by the editorial committee. As to the details, please contact the editorial office. The authors are requested to correct only first proofs carefully. (The paper will be published as it is without their arrival by the designated date.) Some parts of publication and reprint charges will be imposed (see the last part of this instruction). 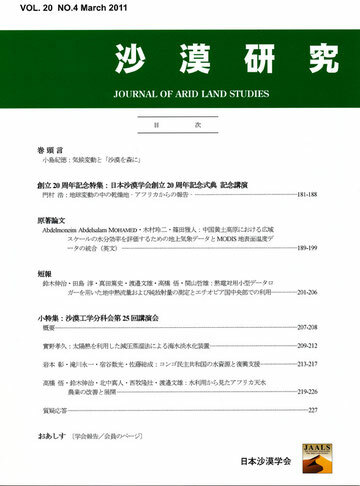 Upon acceptance of an article by the Journal, the copyright of the article is transferred to The Japanese Association for Arid Land Studies. All manuscript should be prepared or ready for printed on A4 (or 8.5 by 11 in.) paper in the order. The text has to be prepared using Ms-Word or compatibles, in double-spacing with 12 point or similar size typeface　(about 80 letters (Half size) × 20 lines). A) Title Page with the following items in this order. b) A descriptive and concise title of the paper. c) Authors' names, affiliation(s), and address(es): first names, middle initials, if any, and surnames followed by their affiliation(s) and address(es). The author who has correspondence should be addressed using superscript (*) with e-mail address and fax number. d) Five or less Keywords. B) Abstract is to be clear and concise. The length is from 250 to 500 words for full-length Original Articles or around 100 words for Research Notes. C) Main Body should be prepared clearly and concisely. The precise arrangement of the text is left to the authors' discretion (Each author may choose the format best suited to the paper). Figures and Tables should not be included but be cited in the body. The placement of the Tables and Figures appearing first should be clearly identified in the body, preferably in the right hand margin. Footnote must not be used. Notes should appear at the end of the body as APPENDIX, if necessary. SI (The System International) unit should be used wherever possible. Standard abbreviation may be used. Literature is to be cited in the main body as Rognon (1994), or (Tucker et al., 1981, 1985; Grove, 1986 a, b; Lean and Warrilow, 1989). The words “et al.” should be used for three or more authors. Lowercase letters following year may be used if necessary to identify. Cited pages from books should be identified as FAO (1993: 15-17). Web site address must not be contained as Literature cited, but must be listed as Annotations before Literature cited. If cited literatures were written in other than English, please describe by which types of language were the literatures written (e.g. In French). Whitman A.A., Brokaw N.V.L., Hagan J.M. (1997): Forest damage caused by logging of mahogany (Swietenia macrophylla) in northern Belize. Forest Ecol. Manag., 92: 87-96. 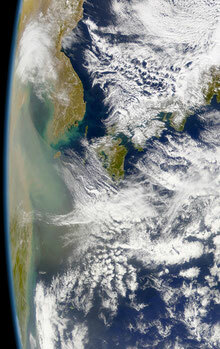 Maki T., Urayama K., Yamashita S., Wakimizu K., Yoshikoshi H. (2009): Changes of Local Meteorological Environment in particular Air Temperature at Isahaya Bay Reclamation Area as a Naked Saline Flat Land. Journal of Arid Land Studies, 19(1): 299-303. SPSS Inc. (1998): SYSTAT 8.0. Statistics. SPSS Inc, Chicago, IL, 1086p. Duke C.V.A., Williams C.D. (2008): Chemistry for Environ -mental and Earth Sciences. CRC Press, Boca Raton. Middleton N., Thomas D. (1997): Saline soils in the drylands: Extent of the problem and prospects for utilization. In Middleton N., Thomas D. eds., World Atlas of Desertification. Second edition. UNEP. E) Figure & table captions and description should be typed on a separate sheet. F) Figures should be prepared clearly. The size of the lettering should be proportional to that of the drawing; it must be a minimum of 3 mm high when the illustration is reduced to 87 mm wide or 180 mm wide. Photos must be included as Figures. They should be saved as the electric files contains first author's name, figure number and figure title (Please inform file type e.g. MS-Word, PDF, MS-PowerPoint etc.). G) Tables should be typed on separate sheets and be prepared in order. No vertical lines should be described inside the tables. They should be saved as the electric files contains first author's name, figure number and figure title (Please inform file type e.g. MS-Word, PDF, MS-Excel etc.). H) After the manuscript has been reviewed and accepted for publication, the author should not carry out any other corrections than those are requested. Electronic file(s) of the final version of the manuscript is then submitted to the Editorial Board by E-mail following the special instructions to be sent to the author. Upon receiving the manuscript, the Editorial Office will send notice of receive to the corresponding author. The author may ask the Editorial Office if he/she has no response for one week since submission. The file types saved inside this storage media should be Word or PDF and Text files as the main body, Tiff, PowerPoint, Word or PDF as the Figures, and Excel, Word or PDF as the Tables. The Editorial Board is responsible for the final arrangement and layout of the articles. Whenever there are unclear points, the authors can consult to the editorial office. The authors are requested to prepare Japanese translations of the following items on a separate page; A-a) title, c) Author(s)' name(s), affiliation(s) and address(es), in the title page, and B) abstract. Kyoritsu Co., Ltd.,, Shin-Kyoritsu Building 2F, 2-22-4, Shinkawa, Chuo, Tokyo 104-0033, Japan. Color page charge: 40,000 Jp. Yen/one color page.